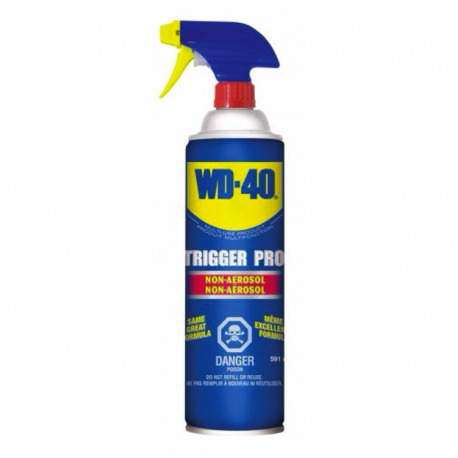 WD-40 is a popular multi-purpose lubricant and is available in a 20 ounce non-aerosol, Trigger Pro spray bottle. Large bottle is sufficient for moderate to heavy use, and pump handle grip offers easy control of the amount of WD-40 used. Adjustable spray nozzle offers both spray and stream options. HARMFUL IF SWALLOWED. KEEP OUT OF REACH OF CHILDREN AND REFER TO WARNINGS ON PRODUCT.